← What’s in the name (Surname)? This post is not another recipe. This is a post from a woman who is recently married and learning about marriage. How simple is it to make cup of tea?Anyone can do it and it takes a minute. But this simple task of making a cup of tea has become so complex in our household. Both me and AS enjoy our cup of tea hot which means, not microwaved and no electrical kettle of hot water. I am not a big tea drinker but when I have one, I like to boil my water, milk, tea and sugar together. I enjoy steaming hot tea. Before I got married to AS I never made tea for myself unless I have a visitor. After our marriage, we started having proper breakfast every weekend which means, in winter, tea was a part of our breakfast. So in the beginning, we had our tea as AS liked it since I have no preference. Strong with less milk and less sugar. But after few weeks I realised that every weekend after breakfast, I had mild headache and it lasted for the whole day. It was nothing sever but I just mentioned that to my cousin (who is a doctor) when we were talking. He asked me if I was having tea or coffee and if it happened after I had one. It gave me a clear picture what was happening to me. I tested it one weekend without tea and yap he was right. I am caffeine intolerant. He told me I still can drink tea but mild ones. I stilled wanted to continue our breakfast ritual for weekends as I loved them. But the problem is that now it takes so much longer to make a cup of tea. This is how we do it. We first boil the water on the stove with 2 teaspoon of loose tea and 2 teaspoon of sugar (one for me and one for AS). After the tea has boiled for a minute we take out half of it into a cup (this is for me) and let the remaining tea boil for a few more minutes. Once it is dark, we filter it into a cup with just a little milk. AS tea is ready now so we rinse the saucepan and add my half of the tea from the cup, add lots of milk and a teaspoon of sugar and boil it. So we have two every different cup of tea ready for two people with different taste. I know it sounds all complicated and we could have done it in two saucepans and make it simple but this works for us. I am learning a lot about marriage from this simple step in our life. Marriage is all about compromise and I am happy, we both are willing to leave aside our individual differences and strike a common balance between us. It makes me so happy that even though we are worlds apart in personality, we can make things work between us no matter what obstacles life will bring us. 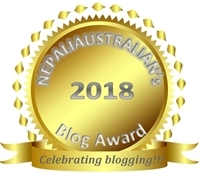 This entry was posted in Marriage, Relationship and tagged family, Nepalese girl, nepali wedding, Nepaliaustralian, relationship, tea. Bookmark the permalink.